Today I traveled in a car with my wife to a high school in New Hampshire a couple of hours away to talk to high school students about the Holocaust, the power of remembering, and witnessing for others who can no longer be the witnesses. As we drove, my wife recalled fondly the many trips she and my mom had taken in years past, in the mountains and valleys of the Green Mountains, along these very roads. We all have our great days, and not-so-great days. But then something happens to reminds us of what truly matters. As it happened, I was speaking to several classes, the first time since my ‘retirement’ nearly 2 years ago. As it happened, one of the classes contained my mom’s granddaughter, one who is studying Elie Weisel’s Night as a 9th grader, and has no real memory of my mom. Oh, I hit it out of the park. (I still got it.) It was a great day. And it happened to be my mother Mary’s birthday in heaven. And so many things reminded me that my mom is still with me. So on her birthday, I’ll share this amazing story again, which begins in a more dark time. Mother Mary comes to me, someone once sang. Happy birthday, momma. My second book, the one on the death train and my journey as a teacher in discovering and retracing the miracles in reuniting Holocaust survivors with their American soldier liberators, has had mostly positive reviews at Amazon. Then recently someone posted how he found himself “resenting” that I had clumsily inserted my own experiences into an otherwise tremendous story. (Fair enough—but ‘resentment’?) Part of it was how my parents, through their example to their children, help to set the trajectory of our lives, as they do for all of us. That, coupled with a resurgence of antisemitism and the other stuff in the public arena that bad dreams are woven of, sent a certain chill up this writer’s—this historian’s—spine. Now if one really ‘got’ the point of my second book, it’s about miracles and goodness and common human decency and humanity; about a triumph of the power of good and love over evil, against crazy odds; about the lessons and the values which we should hold firm to in a world filled with pain and destruction, deception and deceit. I probe and I question: how was I to get on this path, of uncovering these mysteries, of connecting so many people all over the world, through time and across space? I can’t explain it, so I think back to the tangible people who cultivated this sense of wonder in me. Some days it is hard to see the good, and the world lately frankly leaves me feeling rather adrift; I wonder if it all is pointless. Later this week I got an email from a new fan in Salt Lake City, Utah. We have never met or heard of each other until he bought my books at Amazon. He loved them, and then felt compelled to reach out to me (which I invite—it’s matthew@teachinghistorymatters.com). He wrote that as he neared the end of the book, he realized that his wife was from the area where I live and write about. Vintage 1975, autographing his wife’s graduating yearbook… turns out my mom was the school nurse teacher at his wife’s school, now nearly a continent away. Kim was heading out west after graduation, and my mother was going to head there to visit her brother and his family in California that summer. Neither I nor my siblings have ever seen this photo before; I can tell by her expression that Mom is laughing with the photographer and is insisting that he get the shot over with! 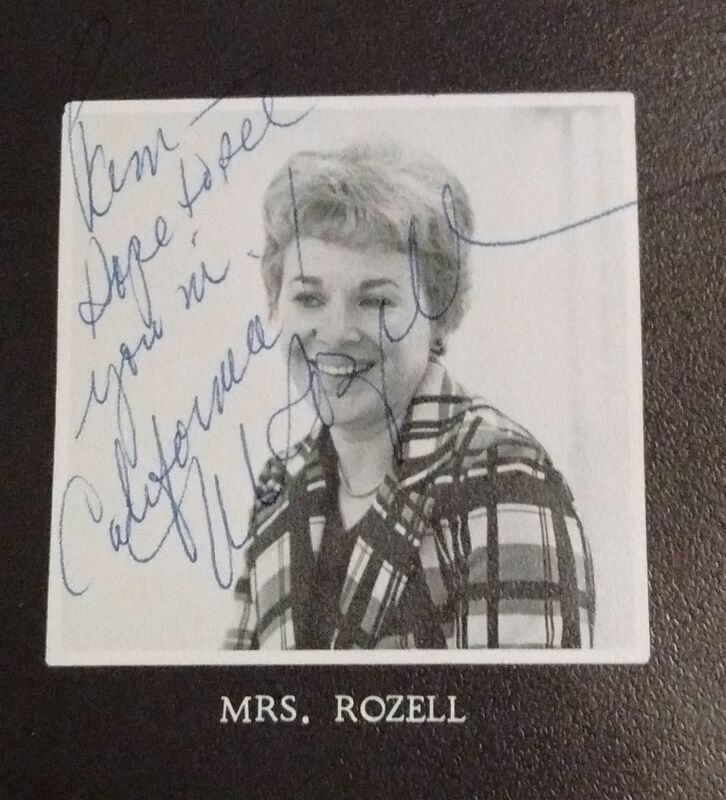 So now, on a dark day, my mother, Mary Rozell, is speaking to me. She was taken from us since just before the Holocaust survivors I write about found me in 2006 and entered my life and the lives of the soldiers who freed them in such a profound way. My mother reaches out to remind me that there is still good in the world. Thanks, William, for sending it to me. And thanks, Ma, for being there for me again.